A hike is a great way to experience the world around you while getting some fresh air and physical activity. Regardless of where and how long you are hiking, there are some supplies you are bound to need, including water and food, or a camera, blanket, or even picnic lunch for when you reach your location. Is This The Backpack for You? For more intense hikes taken by experienced adventurers, how you carry your gear is your ticket to survival. Durability, storage, size, weight, and comfort all play a role in creating the best hiking backpack for your experience. Experts recommend really examining the features of your options in order to not just select the best backpack, but rather the best hiking backpack for you. This is why we’ve put together a comprehensive guide to some of the most highly recommended, highly functional packs on the market. We’ve included detailed information to help you figure out which is best for your hike depending on experience level, length, destination, and a number of other necessary details. This high quality backpack has been an industry favorite with its myriad appealing features and low cost. With its tactful combination of being lightweight while also remaining incredibly durable, it is highly praised among hikers traveling internationally or nation-wide due to its ability to comfortably travel and fold to be placed in a suitcase or carry on. Weighing a mere 0.8 pounds while still maintaining a storage capacity of 25 Liters, this bag allows for maximum storage and minimal strain on shoulders and back throughout your hiking adventure. The bag itself is comprised of a main compartment with two separate sections for increased organization. In addition to this main pocket, the bag also consists of two outer zipped pockets for smaller items like mobile phones or GPS systems to be more easily accessible during your hike. The bag also utilizes two mesh pockets, which are perfect for carrying water bottles or granola bars. The bag comes in a variety of bold colors but many opt for the sleek black or gray option. With a team of experienced designers, this bag has been created specifically for durability and organization, but certainly doesn’t compromise on comfort as it also makes use of high-quality breathable padding on both shoulder straps. With impenetrable polyester built for heavy wear and tear, this bag is sure to withstand whatever harsh conditions you put it up against. Besides the external material, this bag is also reinforced with two-way SBS metal zippers, as well as bar-tacks at major stress points. The designers of this highly rated backpack have anticipated exactly the kinds of situations your pack might be in, and made sure to give you a little extra support to help you go that extra mile. Security checkpoints are a breeze with this bag, which is also the perfect carry on size for American Airlines. Remove it from your suitcase and unfold to use it as a carry on to avoid overweight luggage charges! While this bag is a great choice for long travel, it isn’t as versatile as other models on the market in terms of style and comfort. It does come in a variety of customizable colors, but there are certainly more stylish options on the market! If you are traveling by public transport or any transportation system requiring a baggage limit, this backpack particularly will make getting through security feel like a breeze. Even when traveling by car, this bag has its benefits, allowing you to fold it and keep it empty so that you have space for more luggage, and fill it with souvenirs of your travels on the way home! The Venture Pal Packable Lightweight Backpack Small Water Resistant Travel Hiking Daypack is the perfect option for security navigation as well as hiking day trips. Its perfect blend of sleek, lightweight storage and heavy-duty water and tear resistance makes it an ideal option for trekking up gorgeous mountains or through beautiful forests. It can be use as backpack or shoulder bag through adjusting the strap zipper. Among experienced hikers as well as those trying it out for the first time, this bag has been highly anticipated for its versatility and style. Beginning hikers, or those looking to enjoy a leisurely day trip may find larger, more heavy-duty backpacks to be more trouble than they are worth. This bag blends comfort with versatility and style to bring you a high-quality pack perfect for highly photogenic, Instagram-worthy adventures. The storage is perfect for day or overnight hikes in the great outdoors. With its sleek and stylish design, this bag has become a user favorite as one of the most photogenic backpacks on the market. Organization and storage are certainly some of its best features, as it is comprised of four main pockets, the largest of which contains an additional sleeve within it. While many may be wary of utilizing the zipper pocket that rests against the carriers back area, as items may protrude and make carrying the bag uncomfortable, this bag has anticipated that discomfort and worked toward a comfortable solution. The bag utilizes one half inch of padding on the back, so that regardless of the shape of items placed in the bag, the bag will rest easily and comfortably on your back. This extra layer also means that the objects within the bag are even less likely to be damaged by outside elements you may encounter on your hike. With a magnetic clasp in the front, this bag makes it easy to access small items like a mobile phone or pepper spray, meaning you’ll never have to stop at the side of the trail and rifle through the compartment wasting precious daylight on disorganization. This is by far one of the most stylish models on the market, and it manages to be this without compromising on comfort and storage. Its durable, high-density canvas looks beautiful in photographs against a beautiful mountain range or wooded area. When utilizing a high quality, durable material like canvas, the product may be subject to the natural smells of the material for the first few days upon opening the product. With proper air circulation though, the smell will dissipate within the next two to five days! Families and couples looking to capture some precious memories on their day hike or overnight trip will love this bag for its style. Its sleek design can go from a trek in the woods to a more professional setting with a simple adjustment of the zipper strap to convert this backpack into an over the shoulder bag. Hikers looking for a bag with versatility and style would be incredibly satisfied with the Arbag Backpack / Shoulder Bag / Daypack, which comes in a variety of subtle colors. LIGHTWEIGHT & FOLDABLE - Minimalist Designed, Ultra-lightweight, reduced excess shoulder load, backpack itself weight Only 7.5Oz, making your journey relaxing. It also can be easily folded into a small sandwich size for easy travel. ROOMY - 20L Internal Space, Three Zippered Compartments，Keep Things Organized. The main pocket is Large enough to carry what you daily need. Outer smaller pocket great for quick access such as guidebooks and camera. Inner zippered pocket which doubles as the storage pouch is the perfect place for valuables such as cash, credit cards, and passport. Two large sides mesh pockets for water bottles or umbrella. Perfect for day trips, vacation, travel, day hikes, school, camping, and shopping. WATER RESISTANT - Made with High-Quality Water Resistant Nylon material. Its excellent water-resistant function allows the contents of the backpack to be kept dry for 40 minutes - 1 hour in the rain. COMFORTABLE - 20+ Years Experience makes the Most Comfortable Wide Breathable Mesh Shoulder Straps. S-type meets the Ergonomics, and easy to Adjust the length and lock firmly. TEAR RESISTANT & MUCH MORE DURABLE - The High-Quality Nylon material used in Hikpro backpacks have more textile threads per unit area, so it is tough and tear resistant.Moreover，double fabric at the bottom, reinforced more than 14 places with Bartack process for Extra Strength. This backpack will last for many years. We offer a Five-Year Warranty and you can buy with confidence. This bag is the ideal travel companion for those carrying a heavy load on a short trip. It is a successful combination of comfort and durability, which makes it one of the best selling packs on the market. This durable nylon bag is comprised of three zippered compartments with a large main pocket, small outer pocket, and inner zippered pocket. Its straps are wide for comfort and made with breathable mesh material to keep your shoulders dry and cool on a sweltering hike. This bag was uniquely designed specifically for long-term durability against the outside elements, but also against the elements within the bag. Heavy items are perfectly at home in this bag, as it is reinforced with double fabric at the bottom of the bag. Every element of this backpack is fully capable to stand against the elements, with water and tear resistant nylon on the entire bag, including the side mesh pocket. The bag even keeps the stress of the weight off your shoulders with wide, breathable mesh straps for the most effective way to carry weight. While this bag is well reinforced to allow the storage of heavy items, the space itself only allows up to 20 Liters of storage, making it one of the smaller packs on the market. 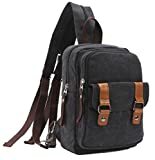 This bag is great for heavy duty short hiking trips and can stand up well against rain storms and carry a large quantity of heavy materials while keeping the strain off your shoulder and not bending or breaking. For longer or overnight hikes requiring the storage of larger amounts of materials and tools, a larger pack might be a better option. Of the bags currently on the market, Hikpro 20L Backpack Hiking Daypack for Men & Women can be counted as one of the best in terms of durability and comfort. Quite simply the best tactical military backpack on the market. This Rucksack bug out bag features a roomy main storage area, dual zipping side pockets and a stuff-it pocket with integrated draw cord and glove friendly pull tabs. Rush24 Tactical Molle bag has a reinforced grab-and-go handle, hydration pocket, zippered fleece-lined eyewear pocket and wrap-around MOLLE/SlickStick web platform. Military Backpack has 2275 cubic inch / 37 liter total capacity with Twin drainage grommets, and self-repairing YKK zippers. Perfect to use as a patrol backpack or trekking pack. 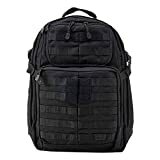 The Rush24 tactical military backpack can be used as a multipurpose pack, bug out bag, range bag, hunting backpack, survival back pack, army backpack, sling bag, hiking rucksack, or every day outdoor backpack. Heavy-duty durability and storage are what you get with this brilliantly crafted tactical backpack. This pack is perfect for experienced hikers who need a bag that is as ready to face the elements as they are. With a whopping 37 Liters of heavily cushioned storage, your tools and survival supplies can fit comfortably in the spacious compartments. Organization is a feature made possible by the inclusion of a main compartment, a hydration pocket, three mesh admin compartments, and a draw cord pocket for easy storage. With its durable external material and water-repellant qualities, this bag can survive even the most violent rainstorms and roughest hikes. This bag has some of the most impressive storage capabilities currently on the market. 37 Liters of storage means all your necessary items can fit comfortably. This packs use of pocket space allows for increased organization, making all your survival supplies easily accessible. This bag is specially built for long trips, with the idea of preparedness being the most influential factor in its design. This means that the bag is approximately three pounds and can be cumbersome and unnecessary for shorter hikes. Heavy-duty hikers need a heavy-duty bag. If preparedness is your motto, then this is the bag for you. With this model, you will never be without the most important tools and survival items. Beginning hikers looking to embark on short day trips may find this backpack cumbersome and difficult to manage, unless they’re up to the challenge. The Rush24 Tactical Backpack for Military, Bug Out Bag, Medium, Style 58601 is available for purchase in a variety of sizes. PERFECT COMPANION FOR TRIPS: This compact backpack is the perfect companion when you are out and about. It will be a fantastic necessity for not matter outdoor sports or leisure activities in or out of the city. Perfect for day trips, vacation, travel, day hikes, school, camping and shopping. INCOMPARABLE QUALITY: Made from High Quality Water Repellent and Tear Resistant Nylon Material, durable Abrasion Resistant SBS Metal Zipper available. Reinforced more than 25 places with Bartack Process. MORE STORAGE SPACE& KEEP THINGS ORGANIZED: Three zippered compartments. Main pocket is Large enough to carry what you need in the trip. Outer smaller pocket is great for quick access such as guide books and camera. Inner zippered pocket is a perfect place for valuables such as cash, credit cards and passport. CONVENIENT AND LIGHTWEIGHT: It fits into an ultra-compact pouch. Easy to folds up into small pocket (Sandwich size). So you can easily pack it in your suitcase for use at their destination as an extra bag for the trip. AIRPORT HERO: Avoid overweight charges, simply unfold from your luggage and use it as a carry on for your excess baggage. The Gonex offers a sleek, lightweight design, great for maneuvering through difficult hikes. Durability is a clear benefit of this high quality bag. With multiple reinforcements against the elements, this pack will keep your items safe and protected even in the harshest conditions. This sleek and comfortable backpack utilizes three zippered compartments for increased organization and storage. The small outer pocket allows for easy access during a long hike, meaning your most important items are always at your fingertips. The product is lightweight and foldable, making it perfect for traveling through security checkpoints. It is great for day hikes, especially those that require a flight or transport on the way. The Gonex Ultralight is reinforced against water, rips and tears, abrasion from use, and heavy items within, making it among some of the most durable small packs on the market. Because it can fold so easily and be placed in a suitcase, many utilize this backpack to remove on the way home and fill with items to avoid overweight baggage charges. While this bag is sleek and well organized, it is relatively small, and can carry only 20 Liters of materials. This means that hikers who anticipate needing a wider array of tools, food, water, and other survival items may be better suited with a larger bag with more storage area. Hikers using this bag can expect to keep this bag for a long time, as it stands up well in any situation it may be placed in. It is small and easily maneuvered, meaning that more experienced hikers can utilize it for difficult day hikes, or long hikes where they are able to stop in at checkpoints more frequently to refill their pack. 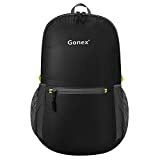 Try out the Gonex Ultralight Handy Travel Backpack on your next adventure!